A valuation of a property may be made for a number of purposes, such as for: (i) investment; (ii) sale by private treaty; (iii) compulsory purchase; (iv) insurance; (v) probate; (vi) a rating assessment or other property tax levy; (vii) an estimate of the going-concern value of a company; or (viii) a mortgage loan security. The value may differ depending on the purpose for which it is required. An insurance valuation may assess the cost of reinstatement of a property, whereas a valuation for sale may assess the ‘open’ market value. There are a number of recognized methods of , including: (i) the comparative or comparison method; (ii) the income or investment method; (iii) the replacement or reinstatement method; (iv) the residual method; or (v) the profits method. More than one method of valuation may be used for any given property, and the method used may vary depending on the purpose of the valuation. For the purposes of the Equal Credit Opportunity Act, “the term ‘valuation’ shall include any estimate of the value of a dwelling developed in connection with a creditor’s decision to provide credit, including those values developed pursuant to a policy of a government sponsored enterprise or by an automated valuation model, a broker price opinion, or other methodology or mechanism’’, Equal Credit Opportunity Act, Sec. 701(e), as inserted by Dodd-Frank Wall Street Reform and Consumer Protection Act of 2010, Sec. 1474(6) (15 U.S.C. 1691). In the US, the term ‘valuation’ is usually used to refer to the assessment of value for taxation purposes; otherwise the term appraisal is used. Also, US appraisal practice refers to approaches to appraisal, and not of methods of valuation. See also before-and-after method, compensation, rating valuation, valuation report. Australian Property Institute. Valuation Principals and Practice (2nd ed. Deakin, ACT: 2007). Australian Property Institute and Property Institute of New Zealand. Valuation and Propery Standards (Looseleaf. Deakin, ACT: 2008). A.A. Hyam. The Law Affecting the Valuation of Land in Australia (4th ed. Pyrmont, NSW: 2009). R.G. Reed. The Valuation of Real Estate: The Australian Edition of the Appraisal of Real Estate, 12th Edition (Deakin, ACT: 2007). R.T.M. Whipple. Property Valuation and Analysis (2nd ed. Pyrmont, NSW: 2006). J. Armatys et al. Principles of Valuation (London: 2009), Ch. 8 ‘Introduction to Methods of Valuation’. A. Cherry. A valuer’s guide to the Red Book 2011 (London: 2011), Ch. 4 ‘Valuation bases’. International Valuation Standards Committee. International Valuation Standards (8th ed. London: 2007), pp. 174–7. J. Murdoch & P. Murrells. Law of Surveys and Valuations (London: 1996). Royal Institution of Chartered Surveyors. Property Investment Valuation in the UK: A brief guide for users of valuations (London: rics.org/valuation). D. Scarrett. Property Valuation: The Five Methods of valuation (2nd ed. London: 2008). E. Shapiro et al. 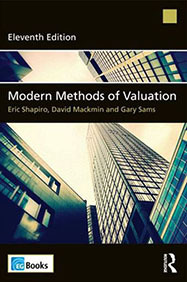 Modern Methods of Valuation (11th ed. London: 2012), Ch. 2 ‘Methods of Valuation’. R.G. Williams. Agricultural Valuations – A Practical Guide (4th ed. London: 2008). Visit our Real Estate Bookstore for more titles on Financial Analysis and Valuation. A 15-day FREE trial of this Online resource is available, as well as our SPECIAL OFFER for new subscribers. Read all about the Valuation and Method of Valuations, with multiple cross references and other sources for further research, in Real Estate Defined.